Home Recipes Ever Eat a Maple Blossom? 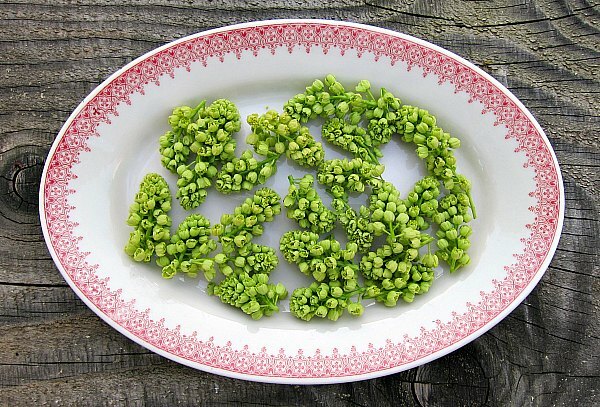 Ever Eat a Maple Blossom? When I was a kid, Euell Gibbons was a household name. Known by many as the Father of Modern Wild Foods, Mr. Gibbons rocketed to prominence after becoming a spokesman for Grape Nuts cereal. His most memorable line, “Have you ever eaten a pine tree?” stuck with me for years. And after chewing on a loblolly pine switch long enough to know it was best left on the tree and not in my mouth, I wondered if Mr. Gibbons was not also a wily prankster getting every kid in America to chew on some backyard conifer. 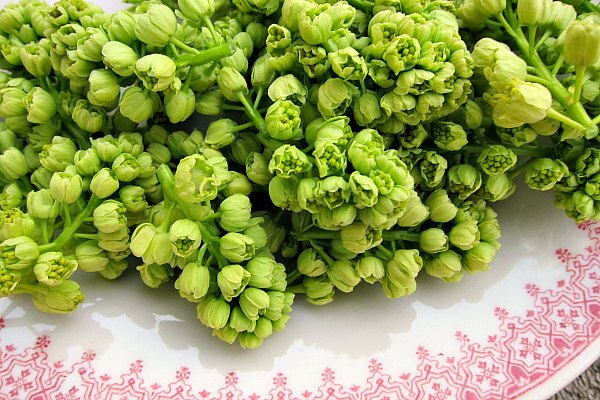 Mini maple blossom bouquets: Almost too pretty to eat. 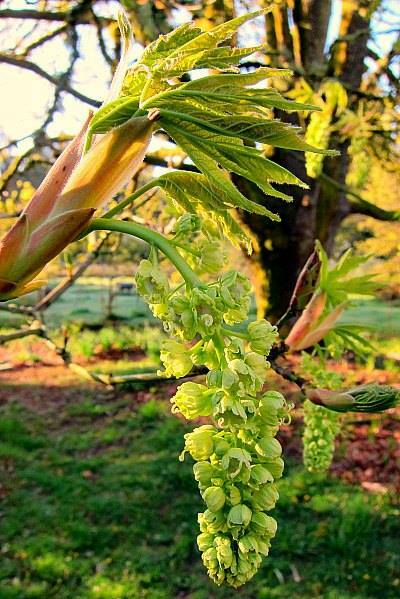 This year curiosity got the best of me, and I rounded up my clippers and headed out the front door to the biggest blooming pollen producer on any green acre: my Bigleaf Maple. I snipped off the young flowers, and avoided the florets that had been out a while and contained a cottony center. 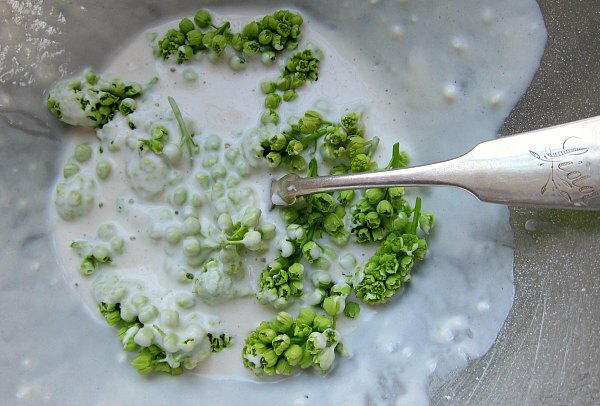 I tried a recipe inspired by one of Seattle’s favorite chefs, Jerry Traunfeld, and featured on a wonderful blog called Fat of the Land. The Bigleaf Maple Blossoms bathed in batter. Whisk ingredients thoroughly to remove lumps. Add 2-3 cups of rinsed bigleaf maple flowers. Remove from heat, and sprinkle salt if you want them savory, or powdered sugar if you want them sweet like a beignet. A fritter for your thoughts? As much as I wanted to love the crispy little packets of deep-fried goodness, I found myself underwhelmed. These green goddess gifts from the maple are best left on the tree in my humble opinion. As vehicles for a deep-fried battered shell, they’re four-star, but on the flavor front the florets are more about adding texture than taste, in my mind. 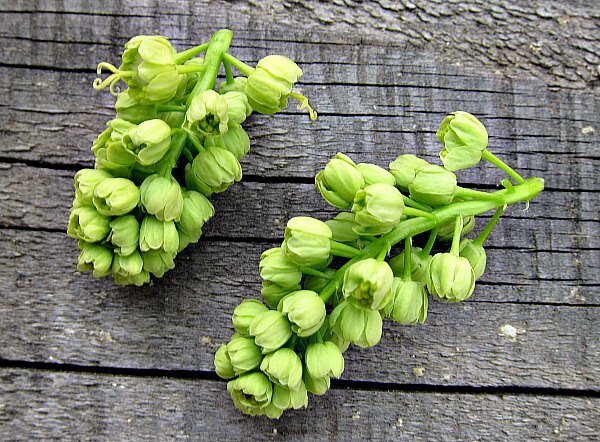 Much like zucchini, maple blossoms are easily over-powered by other flavors and cooking techniques. Think zucchini tempura; tasty but not much flavor. So rest assured my honeybees, the maple blossoms are all yours. I’m glad that I tried my little culinary experiment. Ever eat a maple flower? Why yes, yes I have, and I look forward to my return to kale, chard, arugula and scallions. Stay tuned; I’ll share another recipe for batter fried vegetables that will have you hook on eating your greens, gladly. Ooooh, Tom. What attractive blossoms they are! Not a fan of zucchini flowers either, regardless of stuffing used. There now, I’m out of the closet. Must look up Euell Gibbons, he sounds like my kinda chap. I hope that the hounds are enjoying the change in seasons. Hope you’ve had your first bowl of stinging nettle soup. Now there’s a tasty harbinger of spring. Sandra, the nettles are just laying in wait to sting me. I have to weigh my options; just how much do I live nettle soup, and just how much stinging would I care to endure. No matter what I do or wear, the little brats sting me somehow. 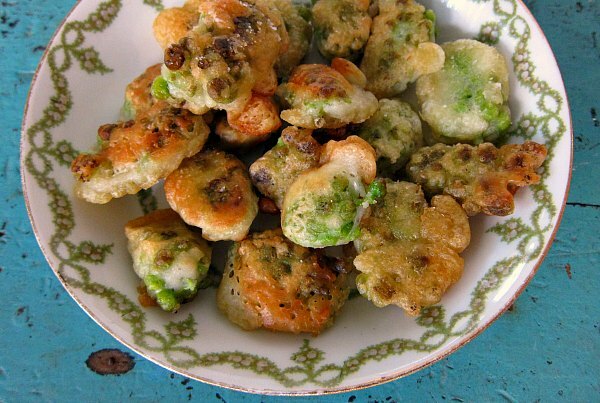 Dandelions fritters, okay I’m game. Now, just to pick a patch where Boz and Gracie are not regular visitors. Thanks for the tip, Michelle! I am waiting for your next experiment in the kitchen! Eileen, I just harvested some honey, so it may just be mead that I try to make. First thing is to wipe down the kitchen, things are sticky after extracting it from the comb. Interesting to read your opinion of maple flower-eating. I tried them years ago, lightly sautéed in butter and folded into scrambled eggs, on the advice of the teacher of my herbal wildcrafting class. I thought they were pretty good. The gist of our wild food eating adventures that year was the useful knowledge that there are several kinds of wild foods: 1) taste great and are good for you; 2) taste blah and are good for you (these are the only kinds you really consider for eating) but there are also foods that 3) taste terrible but are good for you, not to mention 4) taste good, bad or indifferent but will make you sick and the final category 5) foods that it doesn’t matter how they taste, don’t even think about eating them because even a tiny bit will kill you — these are rare but obviously, worth knowing about! 1-3 useful in a pinch (i.e. if starving out in the woods). I am looking forward to seeing what else you decide to munch on…..
Had these in a salad two weeks ago. The buds are growing out, and not so compact now, and I’m wondering if they’re just as good when they’re a little further along. H Rebecca, I’m not too fond of the texture once the blossoms open and get longer. Tougher then, too.